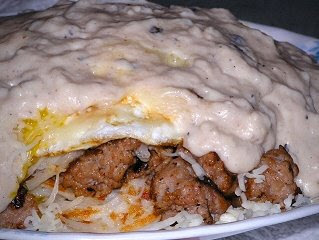 Hash browns and gravy with sausage. I think there's an egg also. I like mine with onions. What are you having for breakfast? I'm also having English muffins with honey, and a little cheddar cheese. And a Coke Cola. Also a BLT on white, with potato salad to go. LOTS of potato salad. And half a pie. That will do me for lunch and dinner. Just lying around watching Season 3 of Roseanne on DVD. And reading Cadillac Desert: The American West and its Disappearing Water by Marc Reisner. Also Victor Davis Hanson's Carnage and Culture. Yummy books, both of them. Open Thread: What are you reading, watching, eating, doing?